History Society honours three members. On Wednesday 18th October 2000 at the first meeting of the 2000/2001 season, three stalwart members of the Society were awarded life memberships in recognition of their work over many years. 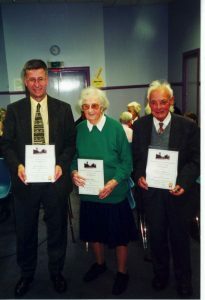 Founding members Dr Mary Noble and George Campbell together with recently retired chairman Neil Stewart were presented with their certificates by chairman Herbert Dryden. Neil Stewart also accepted the position of honorary president of the Society.